Explore the Atlantic Algarve on this self-guided walking holiday in Portugal. Discover the vast landscape of the Algarve region, famous for its beautiful beaches and marvellous coastal scenery. Walk through sleepy villages surrounded by olive groves. Along forest trails and paths and visit the Reserva Natural do Sapal which is famous for its colourful flamingos. With daily walking times between 3.5 and 4.5 hours, the tour can easily be managed with a good basic fitness level. Arrival at Faro and transfer to Tavira. This little coastal town has a very long and beautiful sandy beach to offer, the town centre is full of interesting buildings and boasts 36 churches! A comfortable walk along the coast, starting in the old village of Velha, takes you along deserted paths to the charming fishing village of Cabanas. Its an ideal lunch place to enjoy observing the busy life on the water. You walk back to Tavira along a series of salt pans, home to many different bird species. Details: approx. 4 hours | 14km | Ascent 50m / Descent 50m. Today’s tour takes you into a fertile village, which is well-known for the production of traditional ceramic tiles. You walk across small cultivation areas for olive, carob, almond and fig trees. Continue through lush lemon and orange groves, as well as along fragrant flowering meadows. Details: approx. 4.5 hours | 15km | Ascent 100m / Descent 230m. A perfect opportunity to relax in the hotel or visit the sights of Tavira. A very special experience is bird watching in the moor and wetlands area of the Reserva Natural do Sapal, famous for its flamingos. This idyllic walk leads you along the coast to the Spanish border. From Altura you walk through pine forests on narrow snaking paths and after that on deserted unspoilt beaches to the Rio Guadiana estuary, the river which separates Portugal from Spain. You end the walk in the charming town of Vila Real de Santo António, which offers plenty of interesting cultural history and architecture. Details: approx. 3 hours | 11km | Ascent 10m / Descent 20m. To the west of Tavira is the fishing village of Fuzeta, the starting point of your walk today. You walk alongside salt pans, past little villages with colourful houses and gardens. There are a number of little cafés along the banks of the quietly flowing river. Details: approx. 4 hours | 16km | Ascent 20m / Descent 20m. 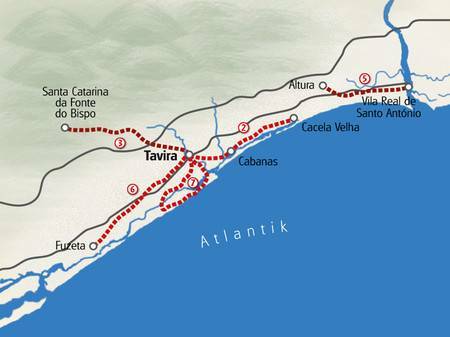 For the finale of your week of walking along the Algarve, you discover the island of Tavira, home to the region’s most beautiful sandy beaches and the extensive nature reserve Ria Formosa. It is true holiday bliss to amble along these beaches and marvel at little fishing villages like Santa Luzia, where countless fishing boats are bobbing gently up and down on the waters of the canal. Details: approx. 3.5 hours | 17km | Ascent 10m / Descent 10m. Daily tours with a walking time between 3 and 4.5 hours which can easily be managed with a good basic fitness level. Walks are on a mix of paths and forest trails through unspoiled nature in the Algarve region and its nature reserves. We recommend flying to Faro airport. Organised transfer to start hotel and return transfer to the airport at the end of the tour are included in the tour price. Important: Please book your flights only after this trip to Portugal has been confirmed by invoice or email. Flights are not included in the advertised holiday price. For passport and visa information, please check the relevant section on this page: https://www.gov.uk/browse/citizenship/passports. General Travel and health Information for your destination is available on the FCO website. Click here for the latest travel advice for Portugal, and click here for useful ‘know before you go’ information also from the FCO. Please note that this information relates to UK passport holders only and that other nationalities should refer to their own authorities for this information. The Atlantic Algarve tour stays in the 4* Hotel Maria Nova Lounge, carefully chosen for its location, hospitality and proximity to your tour route. The hotel is situated in a quiet and slightly elevated location above Tavira, just a 5 minute walk away from the old part of town and offering an amazing view over the idyllic town, the beaches and the Atlantic. The hotel offers all amenities of a 4****-hotel with in-house restaurant and Panorama Bar as well as a garden. The hotel also has both indoor and outdoor pools. See the best of the beautiful island of Mallorca on this week-long self-guided walking holiday, taki.. Explore the unique nature and hospitality of the Azores on this guided walking holiday in Portugal. .. This self-guided tour takes you on some of the best walking trails that the north and west of Mallor..